I love cat art, and since you are reading this page, I guess that you do too, but sometimes the "cute cat" style sameness can make you feel like you've walked down the same block one too many times. As a cat lover as well as an artist, Deborah Julian doesn't let that happen. For creative artists, repetition or imitation is the end of art. The good ones always imagine new angles or original ways of viewing established ones. An artist shoots for excitement, the moment of pleasure you get when you see something new and beautiful. What surprises with Deborah Julian's cat art is sometimes the beauty or stimulation she finds where others haven't. 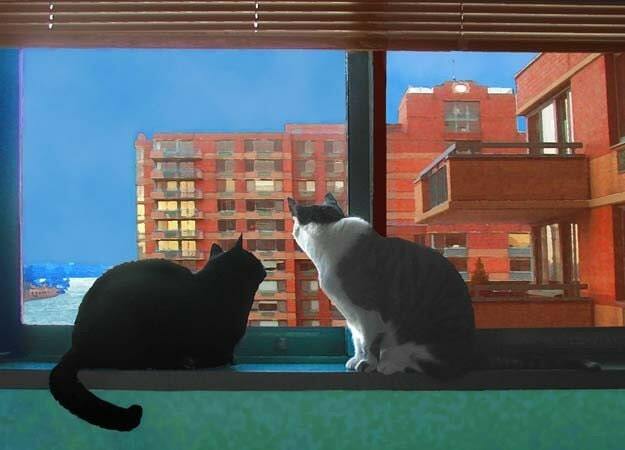 A good example is City Cats, shown here, in which a simple scene of cats in a window is transformed with color and composition into art. If you want to create something exciting and different in cat art, you have to take the cats and the art places they aren't expected to go. Although the art you can find is wonderful and the artists passionate and skilled, the ordinary places have been done. That's okay, but wouldn't you like to surprised by someting totally different but just as wonderful? Great cat artists let their imaginations out to play. One day while spending half her time putting cat magnets together and the other half explaining to her eager cat, Sam, that he couldn't help, she asked herself, "What if all those famous artists had my cats to deal with?" Before she could finish sighing, she had a fresh idea. And then, she had another. Over the coming weeks, her Famous Artists Cats series was born. She began with paintings by famous artist and, then, added cats. The first, Van Gogh's Bedroom (With The Artist's Cats Added) was as hilarious as it was filled with rich Van Gogh colors. The image she created shows the bedroom a weary Van Gogh came home to, after long days in the sun with his paints (or late nights under starry skies. In a situation cat lovers everywhere can relate to, even comfortable place to sit or lay was taken–by sleeping cats. Vincent was left without a place to sit, and since he appreciated so much about having his wonderful cats to come home to, he didn't have the heart to wake them. So, for a while, he just stood an wondered about what cat antics had caused the pictures above his bed to be knocked out of position. All of her cat art with the famous artists isn't funny. Some is just beautiful to look at or amusing to see how a cat fits comfortably in. Here are two more examples. Cat Is the Center of The Universe is a riff on Henri Matisse and one of his iconic paintings. His ecstatic dancers whirl around a cat who thinks they are worshiping him. Who knows? Maybe the are. In Cat In Degas Hat Shop, we find Sam, who may have provoked the whole series, doing what cats do when they find ribbons, no matter where they find them. 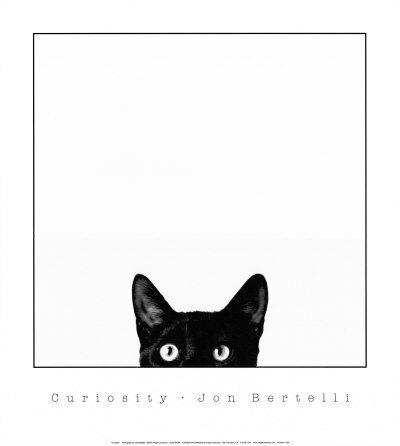 Another new angle in cat art came to Deborah Julian from a different angle when she was asked to illustrate a book about two daring New York cats who smuggle their way across the Atlantic in their people's luggage. Travels With George: Paris finds George, the original daring cat and Billy, tagging along, at many of the most famous sights in the Frence Capital. 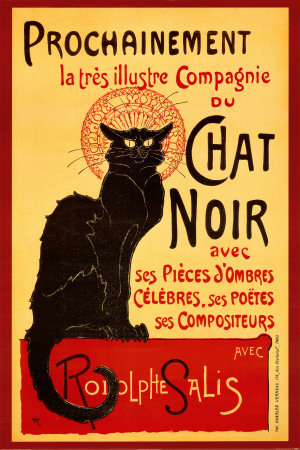 The most popular print from the book was created for a scene in which the cats, out for a stroll above the Seine, are startled to discover a kiosk filled with posters of cats, especially the famous Chat Noir. George and Billy had to take a long, absorbing look at that. Among more than a dozen full color illustrations Deborah Julian created for the book is the one made for their first view of Paris in the morning. Some additional pictures from the series. Interesting coincidence. Someone just gave that book to us as a gift. I've heard good things about it many times. I love the book I could pee on this - gave it to a friend and she loved it. Cats have been an awakening for me. They're a rich combination of dependence, independence and creative genius. 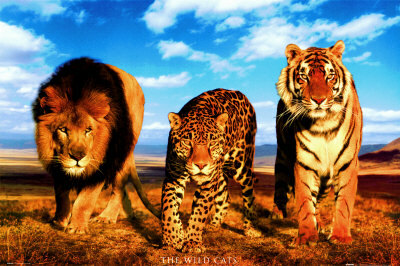 I was born loving all animals. Until very recently I was mainly a dog lover. I recently became as much a cat lover as a dog lover. Just looking at my two cats makes me laugh. Never torment a cat. They'll get even with you. I think you just inspired me to buy some cat art. Thanks, Tolovaj. There are many interesting species out there, some seem as amusing as cats, but cats are the ones we live with observe so much. I think a lot of them see themselves as entertainers. Appreciate your welcome, and I will see you around! Cats are really endless source of inspiration... 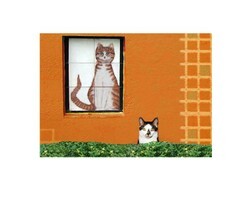 I am not much of a cat person, really, but enjoyed these art pieces anyway. Thanks!